Important: Our shade sails have curved sides to enhance pull strength and prevent drooping; this can add 1″-8″ in side length. Middle-center of sail will be shorter in width due to curves. If straight sides are preferred please contact us. Breathable sun shade sails can be used over a patio, driveway, or other outdoor areas to protect against up to 95% of harmful UV rays; easy to clean with mild detergent and water, fade resistant, will not mold, mildew, stain, or tear. 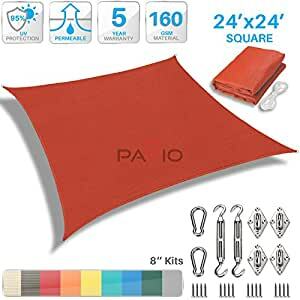 16ft PE ropes and hardware kit and Stainless steel D-rings in each corner make the sun shade sail easily attached to any sturdy connection point to provide sun protection and personal design where you need it. Shade Sail’s will lower the ambient air temperature reducing your properties cooling cost and energy consumption. The savings will pay for the Shade Sail’s over time, with the right design. Sun shade sail is a stylish and effective shade solution that fit most outdoor living space. You can creatively design your own little shady area in a courtyard, pool, gardens, childrens’ play areas, car spaces, and even entry ways. The heavy duty Polyethylene material will keep you cool and out of the hot sun. Also known as Sun Sails, shade sails make beautiful additions to your patio, backyard, or other outdoor areas, while providing excellent protection from the sun and its harmful UV radiation. A chic shade sail is the perfect alternative to a traditional pergola or covered porch. Floating and curvaceous, Shade Sails make an attractive addition to any property, and with the right design, they can enhance the existing property with artistic or architectural flair and style. Sail Shades are wonderfully versatile; they can be attached to homes, fences, trees, or patio columns. In addition, they can be supported by wood posts or steel columns embedded in concrete footings. They can easily be taken down seasonally if necessary. Shade Sails are the ultimate in stylish sun protection. You can creatively design your own little shady area in a courtyard, pool, gardens, childrens’ play areas, car spaces, and even entry ways. The perimeter of each sail is designed with a gentle cantenary curve inwards toward the center of the sail to control the fabric tension. Shade sails have reinforced webbing around the perimeter, and steel D rings at each corner. When properly tensioned, shade sail fabric will not wrinkle, sag, or flap in the wind. The heavy duty Polyethylene material will keep you cool and out of the hot sun. This unique state-of-the-art mesh material will block the sun’s UV rays, and will withstand damages caused by moisture and natural temperature extremes. Washable with regular soap and water. 10 x 20 shade with nice hardware. Thanks! Checked the HOA restrictions after I ordered this and found out I could not hang it. I had to return. Definitely worth the price! These sails will hold up as long as you secure them correctly. There is so much tension..but if you’re a DIYer, you won’t have any problem. put over our deck. just love it! Provides much needed shade on our deck & protects potted plants from the sun! We love it. It has held up well and is perfect for our outdoor seating area.